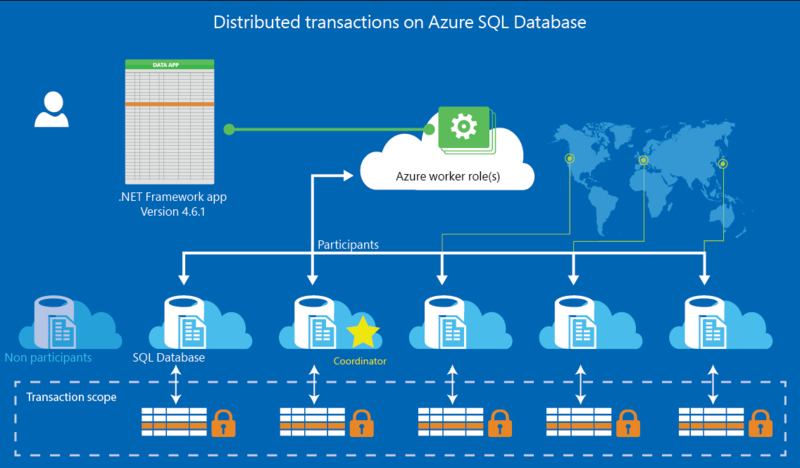 Elastic database transactions for Azure SQL Database (SQL DB) allow you to run transactions that span several databases in SQL DB. Elastic database transactions for SQL DB are available for .NET applications using ADO .NET and integrate with the familiar programming experience using the System.Transaction classes. To get the library, see .NET Framework 4.6.1 (Web Installer). On premises, such a scenario usually required running Microsoft Distributed Transaction Coordinator (MSDTC). Since MSDTC is not available for Platform-as-a-Service application in Azure, the ability to coordinate distributed transactions has now been directly integrated into SQL DB. Applications can connect to any SQL Database to launch distributed transactions, and one of the databases will transparently coordinate the distributed transaction, as shown in the following figure. Elastic database transactions for SQL DB enable applications to make atomic changes to data stored in several different SQL Databases. The preview focuses on client-side development experiences in C# and .NET. A server-side experience using T-SQL is planned for a later time. Multi-database applications in Azure: With this scenario, data is vertically partitioned across several databases in SQL DB such that different kinds of data reside on different databases. Some operations require changes to data which is kept in two or more databases. The application uses elastic database transactions to coordinate the changes across databases and ensure atomicity. Sharded database applications in Azure: With this scenario, the data tier uses the Elastic Database client library or self-sharding to horizontally partition the data across many databases in SQL DB. One prominent use case is the need to perform atomic changes for a sharded multi-tenant application when changes span tenants. Think for instance of a transfer from one tenant to another, both residing on different databases. A second case is fine-grained sharding to accommodate capacity needs for a large tenant which in turn typically implies that some atomic operations needs to stretch across several databases used for the same tenant. A third case is atomic updates to reference data that are replicated across databases. Atomic, transacted, operations along these lines can now be coordinated across several databases using the preview. Elastic database transactions use two-phase commit to ensure transaction atomicity across databases. It is a good fit for transactions that involve less than 100 databases at a time within a single transaction. These limits are not enforced, but one should expect performance and success rates for elastic database transactions to suffer when exceeding these limits. The capabilities for elastic database transactions in SQL DB are provided through updates to the .NET libraries System.Data.dll and System.Transactions.dll. The DLLs ensure that two-phase commit is used where necessary to ensure atomicity. To start developing applications using elastic database transactions, install .NET Framework 4.6.1 or a later version. When running on an earlier version of the .NET framework, transactions will fail to promote to a distributed transaction and an exception will be raised. After installation, you can use the distributed transaction APIs in System.Transactions with connections to SQL DB. If you have existing MSDTC applications using these APIs, simply rebuild your existing applications for .NET 4.6 after installing the 4.6.1 Framework. If your projects target .NET 4.6, they will automatically use the updated DLLs from the new Framework version and distributed transaction API calls in combination with connections to SQL DB will now succeed. Remember that elastic database transactions do not require installing MSDTC. Instead, elastic database transactions are directly managed by and within SQL DB. This significantly simplifies cloud scenarios since a deployment of MSDTC is not necessary to use distributed transactions with SQL DB. Section 4 explains in more detail how to deploy elastic database transactions and the required .NET framework together with your cloud applications to Azure. The following sample code uses the familiar programming experience with .NET System.Transactions. The TransactionScope class establishes an ambient transaction in .NET. (An “ambient transaction” is one that lives in the current thread.) All connections opened within the TransactionScope participate in the transaction. If different databases participate, the transaction is automatically elevated to a distributed transaction. The outcome of the transaction is controlled by setting the scope to complete to indicate a commit. Azure provides several offerings to host .NET applications. A comparison of the different offerings is available in Azure App Service, Cloud Services, and Virtual Machines comparison. If the guest OS of the offering is smaller than .NET 4.6.1 required for elastic transactions, you need to upgrade the guest OS to 4.6.1. For Azure App Services, upgrades to the guest OS are currently not supported. For Azure Virtual Machines, simply log into the VM and run the installer for the latest .NET framework. For Azure Cloud Services, you need to include the installation of a newer .NET version into the startup tasks of your deployment. The concepts and steps are documented in Install .NET on a Cloud Service Role. Elastic database transactions are supported across different SQL Database servers in Azure SQL Database. When transactions cross SQL Database server boundaries, the participating servers first need to be entered into a mutual communication relationship. Once the communication relationship has been established, any database in any of the two servers can participate in elastic transactions with databases from the other server. With transactions spanning more than two SQL Database servers, a communication relationship needs to be in place for any pair of SQL Database servers. New-AzSqlServerCommunicationLink: Use this cmdlet to create a new communication relationship between two SQL Database servers in Azure SQL Database. The relationship is symmetric which means both servers can initiate transactions with the other server. Get-AzSqlServerCommunicationLink: Use this cmdlet to retrieve existing communication relationships and their properties. Remove-AzSqlServerCommunicationLink: Use this cmdlet to remove an existing communication relationship. Use Dynamic Management Views (DMVs) in SQL DB to monitor status and progress of your ongoing elastic database transactions. All DMVs related to transactions are relevant for distributed transactions in SQL DB. You can find the corresponding list of DMVs here: Transaction Related Dynamic Management Views and Functions (Transact-SQL). sys.dm_tran_active_transactions: Lists currently active transactions and their status. The UOW (Unit Of Work) column can identify the different child transactions that belong to the same distributed transaction. All transactions within the same distributed transaction carry the same UOW value. See the DMV documentation for more information. sys.dm_tran_database_transactions: Provides additional information about transactions, such as placement of the transaction in the log. See the DMV documentation for more information. sys.dm_tran_locks: Provides information about the locks that are currently held by ongoing transactions. See the DMV documentation for more information. Only transactions across databases in SQL DB are supported. Other X/Open XA resource providers and databases outside of SQL DB cannot participate in elastic database transactions. That means that elastic database transactions cannot stretch across on premises SQL Server and Azure SQL Database. For distributed transactions on premises, continue to use MSDTC. Only client-coordinated transactions from a .NET application are supported. Server-side support for T-SQL such as BEGIN DISTRIBUTED TRANSACTION is planned, but not yet available. Transactions across WCF services are not supported. For example, you have a WCF service method that executes a transaction. Enclosing the call within a transaction scope will fail as a System.ServiceModel.ProtocolException. For questions, please reach out to us on the SQL Database forum and for feature requests, please add them to the SQL Database feedback forum.